You've all heard and read about Hybrids and a good number of you are driving one as well. But what about Plug-in Hybrids? It's a pretty new term though Canada's first Plug-in Hybrid vehicle, the Chevrolet Volt had been on sale in Canada as early as 2011. Ford Motor Company is undoubtedly the most aggressive of all car manufacturers to furnish its showrooms with hybrids, plug-ins and pure electric vehicles. In just one year, Ford and Lincoln has brought to market totaling at least 6 such vehicles including 2 plug-ins, the Ford C-MAX Energi and the Ford Fusion Energi. Like Hybrids, Plug-in Hybrids have a gasoline engine, can operate solely on electric power and will automatically switch to burning fuel once all the electric juices are consumed. But unlike Hybrids, Plug-in Hybrids DO NOT need or rely on a gasoline engine to survive, well at least theoretically. As long as the battery is being fully recharged every 43 km (range according to Natural Resources Canada Fuel Consumption Guide) of distance travelled, you can throw away your Petro-Canada, Esso and Shell cards. Heck, not only will you not need to worry about oil prices anymore, even Hydro bills too? Why? Because you can use some dedicated charging stations like the one at Richmond Hill Town Centre parking lot for FREE! Check my photos, I was there at least twice the full 7 days I had the Ford C-MAX Energi and didn't spend a cent. MSRP of C-MAX Energi starts at $36,999. Current C-MAX owners will notice this is a lot more than their non plug-in hybrid. 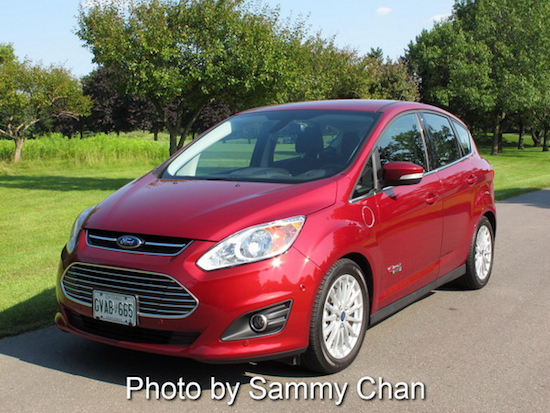 Actually, Energi costs $7,000 more than the $30,199 C-MAX Hybrid SEL it is derived from. The number one question you are entertaining right now must be "Is the extra cost justifiable or in other words, will it be recaptured through fuel savings over the course of ownership?" The answer is a definite "YES" but with qualifications. According to the 2013 Fuel Consumption Guide published by Natural Resources Canada (NRC), the annual $ cost for operating the C-MAX Energi on gasoline alone is $1,161 but this amount will be drastically reduced to $403 if running a mix of gasoline and electricity. NRC's calculation is based on an annual driving distance of 20,000 km with a mix of 55% city driving and 45% highway driving. Furthermore, its forecast price for gasoline is $1.29/L for regular gasoline. An annual savings of $758 per year will translate into $7,580 over 10 years and $11,370 over 15 years. But what if I recharge it for free every 43 km I drive? Theoretically, I will save $11,161 in just 10 years, that's what I meant "with qualifications". There are also things that money cannot buy like zero carbon dioxide emissions when driving solely on electric power hence your valuable contribution to planet earth and the fun of being able to drive alone on an HOV lane! Only Plug-in Hybrids and pure Electric Vehicles qualify for a "Green" license plate in Ontario. This "Green" plate will give you the privilege of driving without passenger(s) on all HOV people movers. In addition, you are also allowed to park your green vehicle at many parking spots usually reserved for the physically challenged, how neat. Styling-wise, there's no discernible differences between the C-MAX Energi and C-MAX hybrid, both are classified as Mid-size vehicles by NRC (Surprisingly, the larger Chevrolet Volt is deemed a Compact vehicle due to its smaller interior volume). An extra "fuel" filler cap on the left front fender is the only visible que. The 2.0 litre DOHC 4-Cylinder engine it shares with the C-MAX Hybrid is still an important and integral part of the C-MAX Energi. When combined with the 68 kW electric motor, this engine is capable of generating a net total system output of 134 horses and 153 lb-ft of torque. The engine is of the Atkinson variety commonly adopted for Hybrids due to its capability of keeping intake valves open longer and as a result a lower fuel consumption and greater efficiency can be achieved. Charging the C-MAX Energi is easy as long as there's a three-prong power outlet available at your disposal. An ordinary household AC 120V will suffice. Simply connect the supplied charging cable to both the driver's side charging port and the power outlet and leave it for around 2.5 hours and you've got a further 43 km driving range added to your "tank". Even better if you can find a public charging station like the one I frequented at Richmond Hill (Ontario) Civic Centre parking lot. A coffee break of 90 minutes (most charging stations are AC 240Vs) will get the job done. According to NRC, the C-MAX Energi can achieve as low as 1.9 Le/100 km when operating in pure electric mode. You might ask "Shouldn't it be Zero (0) fuel consumption in that mode?". Yes, if your electric fill-up is free like in my case using the one at RH Civic parking lot. NRC did take your hydro bill cost into consideration and has a formula for converting your hydro cost to "gasoline" money. Each Le or litres equivalent as defined by NRC contains the energy equivalent of 8.9 kWh of electricity, in other words, a distance of 100 km city driving would cost you $4.77 if consuming gasoline but would cost you only $2.58 on your home hydro bill if running the Energi on EV mode. NRC fuel consumption figures of C-MAX Energi: HV mode City 4.3 / Highway 4.7 / Combined 4.5; EV mode 1.9 Le/100 km. NRC also quote a gas-plus-electric driving range of 1,221 km before you empty both the lithium-ion battery and the 52.9-litre fuel tank. Switching between battery and engine power source is totally seamless. Driving in pure electric mode is actually more fun, not only is it eerily quiet, power delivery is so instant and addictive that will quickly change your views of electric vehicles altogether. Stepping on the accelerator pedal has a similar effect as triggering your power drill, imagine that! Any speed over the 100 km/h EV limit will automatically switch to gasoline engine operation, same goes to flooring the accelerator pedal, during sudden acceleration, heater in use, when outside temperature falls below -10 Celcius or when hybrid system either gets too high or too low. You can also switch from EV to HV mode or vice versa anytime you want, but EV mode is best preserved for city driving. You can also download MyFord™ Mobile app to your mobile phone making it convenient to monitor the status of your car from anywhere you are. One neat function is to check the charging status of your vehicle while watching your favorite TV show at home. An app called the MapQuest® trip planner will also take you to the nearest charging station the most efficient way. The C-MAX Energi comes with plenty of standard safety features including the MyKey® teen safety feature, SYNC 911 Assist™ and seven airbags. Utilizing hands-free phone capabilities, SYNC 911 Assist connects the driver directly with a local 911 operator should an accident occur in which an airbag deploys. The next-generation MyKey allows parents to choose from multiple top speed limits and blocking of explicit satellite radio programming, it also provides a persistent audible warning if front occupants are not wearing seat belts. Other standard safety and driver-assist technologies include Curve Control that is designed to slow the vehicle when it’s cornering too fast and Torque Vectoring Control to help accelerate through a turn when necessary. AdvanceTrac® with Roll Stability Control™ (RSC) and electric power-assisted steering (EPAS) also are standard. Also worth mentioning are the rearseats' inflatable seatbelts which won AJAC's 2012CCOTY "Best New Technology" Award. Due to the larger battery which eats into trunk space, cargo capacity of Energi has been reduced from Hybrid's 694 litres to 544 litres. Folding the rear seat back forward (a strong advantage over the Toyota Prius PHV its closest competitor) will increase cargo volume from 544 to 1,211 litres. Thankfully, there's no encroachment into rear room space, 2 adults will find plenty of legroom, headroom and shoulder room in the rear. The Sony 9-speaker audio system which comes with the optional Equipment Group 303A looks and feels expensive and is well worth the ticket.